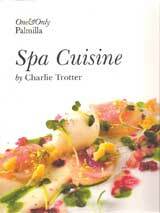 Charlie Trotter’s spa food cookbook is spa food and a whole lot more. First of all, it is a feast for the eyes. Of some 221 pages, about 76 are recipes and gorgeous full-page, full-color photos of chef Trotter’s stunning cuisine. Chicago photographer Kipling Swehla has filled the remaining pages with images of the resort art photography of the highest order. I was talking with a chef acquaintance of mine about how I was so excited by this work. He told me that it was one of those coffee table books, to be admired but not taken seriously as a working cookbook. He’s wrong. I made the recipe for Grilled Chicken with Quinoa Tabbouleh and Parsley Vinaigrette and it was delicious and not at all difficult to make. The hard part is the conception and creation of these dishes and plating them to arrive at such astonishing beauty. It’s just food, just like Vermeer’s paintings are just oil on canvas. Many artists-in-training can copy an old master painting with a good result, but it is the creativity of the master who conceived the work that is hard to grasp.